Karyn Myers, in a leadership training course of mine, used the “Positive Change Questions” and “Positive Reframing” to help solve a high-stakes family challenge. I think it’s a wonderful story. Situation: My son’s wedding. The wedding party was meeting for the rehearsal the day before the wedding at 6:00pm. During the rehearsal we realized that there WERE NO FLOWERS at the spot where the couple were exchanging vows. The bride thought in May that there would be flowers grown in where the arbor was but there was nothing. Needless to say, chaos ensued. Cavemen came charging in with Freeze (the bride), Fight (moms and others), Flight (Groom). Goals: Decorate the area or get flowers and make sure everyone was still speaking at the rehearsal dinner (which was in 45 minutes). What worked: Asking everyone what we could do in the time that we had to fix the situation. Everyone kept coming back to why/how did this happen, why didn’t someone think of this, how could this happen, etc. Meanwhile, the time is ticking by with nothing happening and everyone blaming. I came back a number of times asking for ideas to make this special for Melissa and Andrew (the bride and groom). Responses, at first, started with, “I can’t believe this is happening…”. I tried to refocus them by saying that this gives us a great opportunity to do something for the couple and have a part in creating their ceremony. That seemed to be the comment that started to bring people around. Then ideas started coming from people about what they had at home, who could run to the store, florists in the area to contact right then, who could pick up if we found a florist, who would be in charge of setup. It really drove home the positive concept for me because as soon as people realized that they could contribute in a meaningful way and knew what the end goal was things started to come together. It was beneficial for me because I would not have handled this situation this way if I had not participated in this course. I also would not have seen the situation in quite the same way – I would have been too involved in the emotions and blame. 3. What else? : This really wasn’t a situation where this applied to the group, but I was able to see positive change in action and had a part in its direction and seeing it evolve. It was interesting to see the different personalities (Caveman, Artist, Thinker) come into play. Question from Bob: Where can you save the day using these questions? 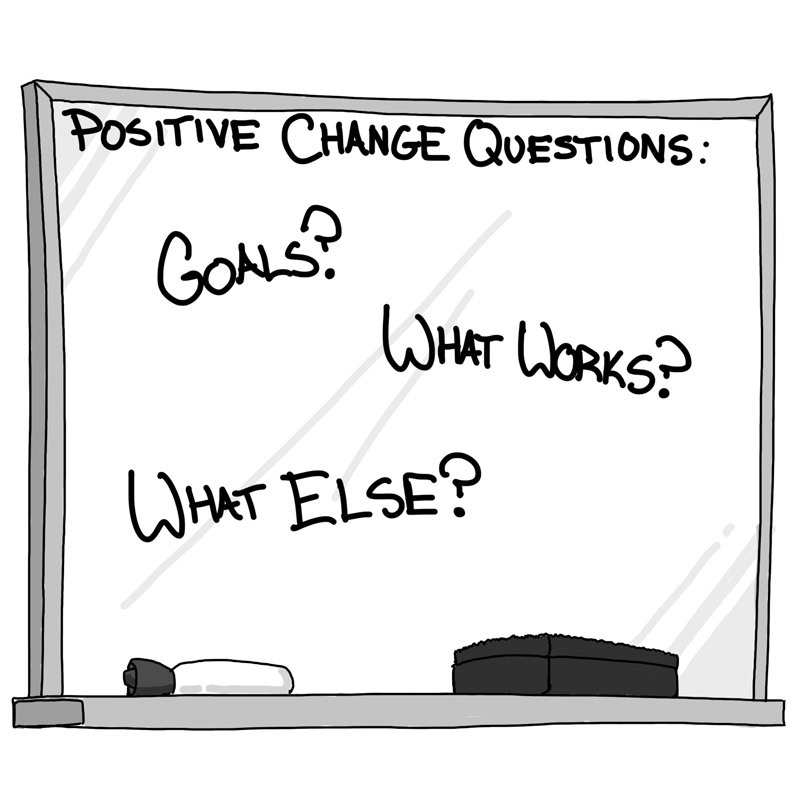 The positive change questions remind me of the coaching framework GROW: Goal, Reality, Options, Way forward. I have found GROW to be very useful. John, you raise a good point. I really like the GROW framework as well.